PROOF: Watch Me Instantly Turn A Blog Into An Irresistible Click Magnet... Generating Clicks, Leads & Sales On Demand! This is a time limited special offer, it may be closed down at ANY TIME & the price WILL go up very soon! Sign up now and secure your discount today! We will soon be selling the Covert Messenger Pro plugin for $97. But you will save over 50% when your order from this special early bird page today! The Most Effective Ads You Can Put On ANY Wordpress Blog! 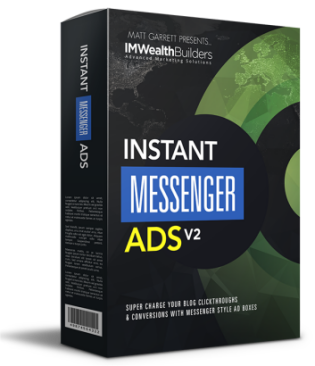 Create as many profit pulling ads as you like... Today and from this page only, you get an unlimited site license for the Covert Messenger plugin! No technical skills required... the plugin installs with just a single click and setting up an ad is as easy as creating a new WP post. You can have your first ad up and running in minutes from right now, with just a few clicks! Enjoy click through rates like never before... people will notice your ads and they will click on them - guaranteed! Promote your affiliate link, build your list or promote your own products and sites... it doesn't matter what niche you are in, Covert Messenger is the most effective ads you can put on any WP blog! 5 Good Reasons To Secure Your Discounted Copy Of Covert Messenger Today! 100% mobile & tablet friendly: Covert Messenger is designed to work perfectly on all devices so now you can easily monetise your traffic across all platforms. We have even included the option to turn off your ads for mobile and/or tablets! Step-By-Step Tutorials: as usual we have created a super easy step by step setup wizard for the plugin along with detailed mini-tutorial videos right where you need them when you need them! Great Support: as always you will get all the support you need and also free access to all future updates to the plugin! The lowest price you'll ever see: we can guarantee that you will never see Covert Messenger at a cheaper price than on this page, right now! The price is going up with every order and we are going to sell this for $67 or more in the near future! How Covert Messenger Works & How It Uses Deep Rooted Psychology To Almost Force People To Click Your Ads! First of all the Covert Messenger is a super simple to use and install (1 click install) WordPress plugin. That means the software will work on any computer, all you need in order to use it, is a self hosted WordPress blog. Write any text you want on your Covert Messenger. You can even use HTML to make text bold, use different colors and lots of other effects including images! Preview your ad in real time as you create it! You can link your Covert Messenger ad to any page you want. Affiliate links, CPA offers, your own sites etc. When people click anywhere on your ad they will go to the link you specified! 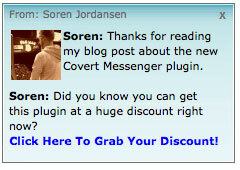 And in just a couple of minutes you can have a Covert Messenger ad live on your blog. 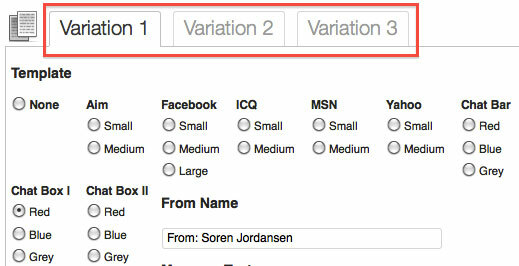 It will look like a normal instant messenger notification - using the same familar templates people know and love! Do you think people will click that ad? Covert Messenger Gets More Clicks & Better Conversions Than All Other Ad Forms Combined On Our Blogs! Everyone on the internet uses some form of instant messengers. In fact there are no dating affiliates left reading this - they have all clicked the buy button already - because they know how powerful this is! On a review blog - make a Covert Messenger ad that tells them about a discount. Then ask them to click the link to claim their discount! Offer a freebie related to the content on your blog and ask them to click in order to grab it (then link your squeeze page). Use the same technique to link to CPA offers related to your blog. They won't click your banners, they have seen them all before. But they will click your Covert Messenger ad and you can start counting the $$$! It will get people's attention & they will click on your ad! 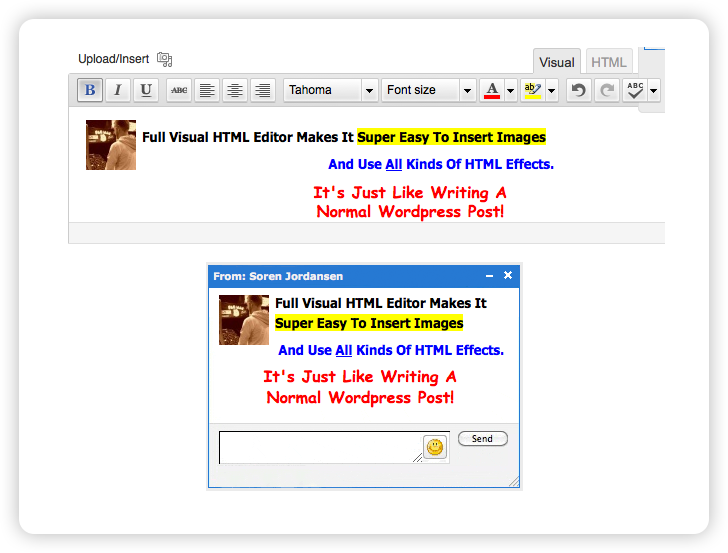 The editor works just like the one you have in your WordPress post area, so there is no learning curve. And you get all the features such as; different fonts, colors, sizes and effects... And most importantly the option to insert images on the fly!. 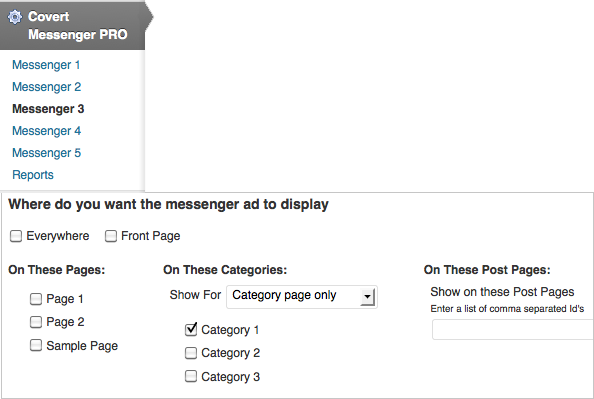 In the Pro version you get 9 extra templates for your Covert Messenger ads. 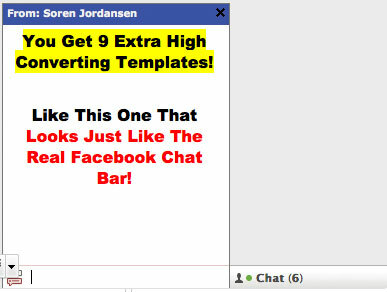 And these extra templates are the ones that will attract the most attention and clicks - like the example one above that is designed to completely mimic the real Facebook chat bar! Right Down To Individual Posts! The PRO version allows you to run 5 ads at the same time! And you get full control over where you want a specific Covert Messenger Ad to appear. As you can see on the screenshot below you can choose to display a Covert Messenger ad everywhere, on specific pages, on posts in specific categories... even on individual posts! But more importantly the PRO version will track the displays and clicks for each variation. The stats will be recorded in your WordPress Admin area as you see below, so you can easily split test your ads and increase your clicks and revenue! Each variation can use it's own template & link to it's own URL! And Catch Your Visitors Attention Like Never Before! Super simple controls to enable sound on your Covert Messenger Ads. If you turn sound on it will play a familiar instant messenger sound the first time your ad pops up - really helping to grab your visitor's attention. You Had Me At "10x The Clicks!" But What's This Going To Cost Me? 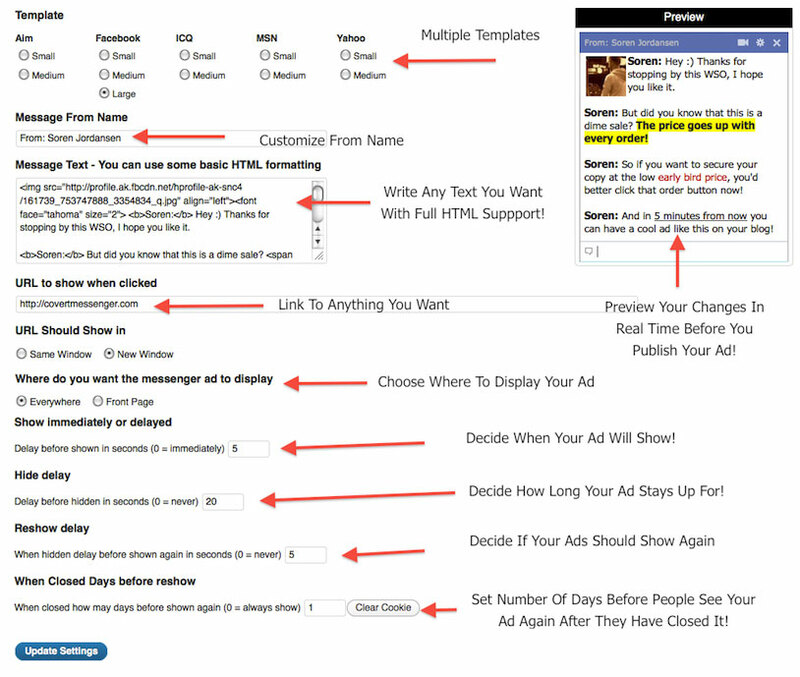 Split Test Up To 3 Variations On The Same Ad: And Automatically Split Test Your Variations So You Can Get More Clicks, Leads & Sales. Each Variation Can Use It's Own Template & Link! Play Sound On Your Messenger Ads: Easily Turn Sound On For Your Covert Messenger Ads To Really Grab Your Visitor's Attention! Obviously people are willing to pay big money for a simple to implement technology that has been proven to increase your traffic, clicks, leads and sales! And we fully intend to release this on at a much higher price later on - $67 or more! But right now, and from this special page only... You can get your hands on the Covert Messenger plugin for a fraction of that! And when you order today you'll be "grandfathered" in and receive free updates for life! If your order the Covert Messenger plugin from this special page today, we'll even include multi-site and developer's license at no extra cost! Use Covert Messenger on as many of your own blogs as you like - existing and future ones! And you will certainly not see multi site and developer's licenses included at such low a price, ever again! Click The Button Below To Secure Your Copy Of The Covert Messenger Pro Ver 2 Plugin Before The Price Goes Up! P.S. The only way you can lose here is if you walk away empty-handed... This really is the most effective way to generate more clicks, leads, traffic & from your blog!